Well, this is it. 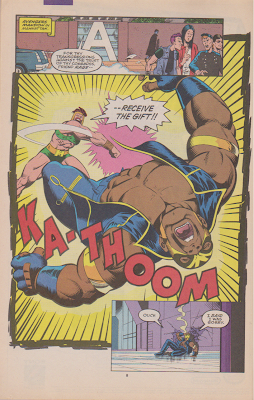 the final issue of my look back at the New Warrior's first series. And as I said before, it's not that there is anything wrong with the 49 other issues, but I want to go back to my 5-panels. And it may also be a good place to stop, since Bagley stops being the penciler and get's replaced with Darick W. Robertson... Bummer. Anyway, lets get to the actual story. Remember the jet that the New Warriors stole from the Avengers? It got stolen by the Circle when they ran away. The Avengers is less than pleased about this. With the exception of Hercules, who might overreact a tidy bit, the Avengers actually takes it rather well, considering that we talk about a jet worth three-quarts of a billion dollars, not to mention the damage done on the hangar. They understand that Rage meant no harm, and he was just trying to help the Warriors. BUT that doesn't change the fact that Rage stole a million dollar plain, so there has to be consequences, and the Avengers must kindly ask Rage to leave the team. After packing his stuff and leaving the Avengers Mansion, Speedball is waiting for him outside, and ask Rage if he wants to be a full-time member of the Warriors. Rage accepts the offer, possibly looking forward to be on a team where his teammates will be closer to his age. And the Warriors are in need of more members, since Thrash has taken a leave of absence, so he can get control over his life, witch you can read all about in his four issues mini: Four Control. You can read my review of the series RIGHT HERE! 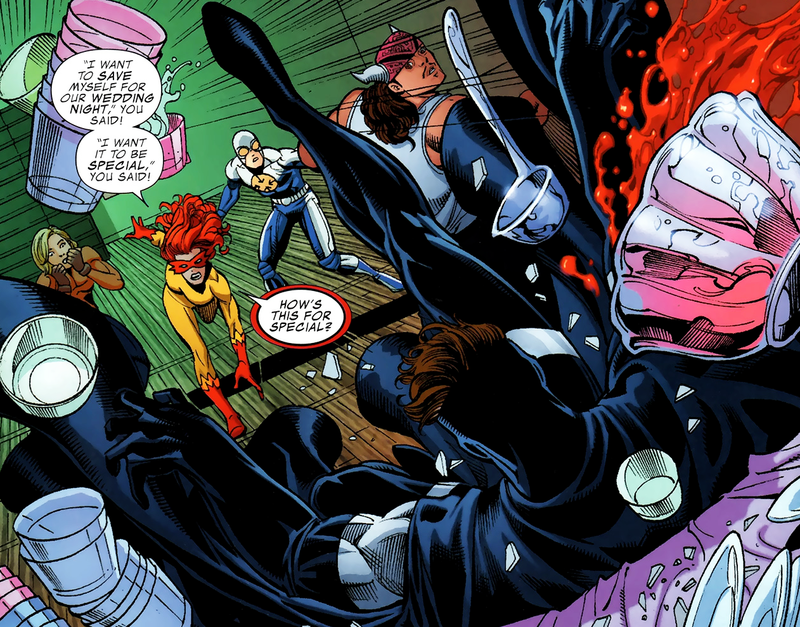 Meanwhile, Nita, Nova and Firestar decides to rescue Vance from jail, by stopping the prison-truck transporting Vance to the superhuman prison; The Vault. They manege to do so, and takes on the guardsmen. But before the situation can get out of hand, Vance use his telekinesis to stop the fighting. He tells his friend that he doesn't want to be freed. Even though he didn't intent to kill his father, he still did so, and that means that he has to go to jail. Nita yells that its not fair, smashing a three in anger, to which Vance reply that its not important what they think about the laws, but that they lived by it. He appreciate that they want to help him, but there is a system in the country, in witch Vance believe in, And even though he could use his powers to ignore the law, doesn't mean that he is above it. How you like THAT, X-Men? 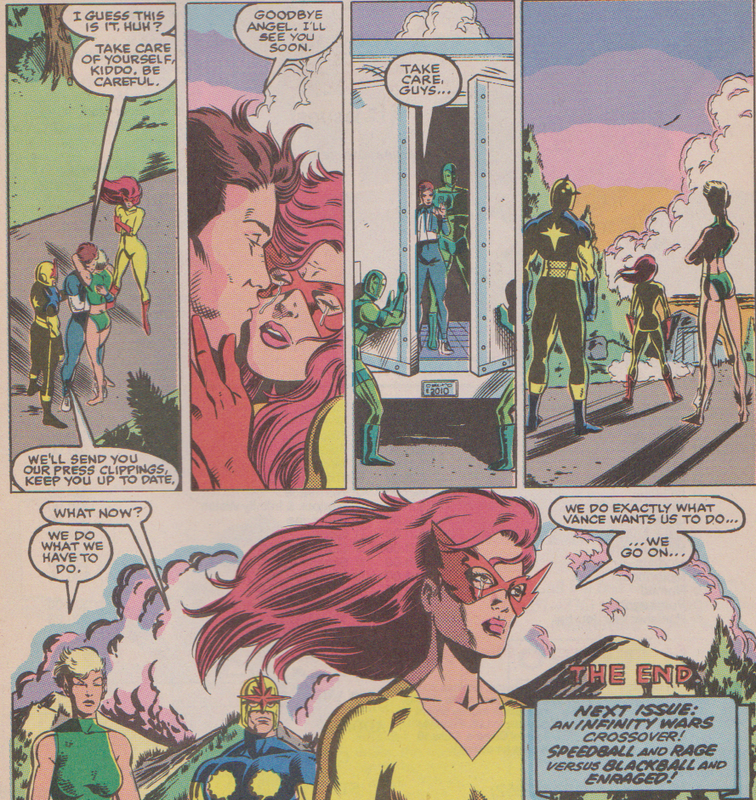 There could have been serous consequences for the Warriors, if it wasn't for the fact that Vance has the guardsmen sympathy, so they are ready to leave the Warriors off the hock, IF they help them fix the van, as Firestar and Vance is allowed a private moment before they drive Vance to the Vault. Firestar confess her love to Vance, which he return, and she tells him that she is ready to offer herself to him, both spirit and body. That's right, she wants to "do it" with Vance, out in a forest, with two of their friend and three strangers only a few meters away. DUDE!!! Before I go on, I would like to ad that I'm not mocking a young woman, who are about to say goodbye to her first serious love-interest, and therefor want's to share the ultimate intimacy with him, before he gets locked up and she won't see him for a long time. But still... DUDE!!! Vance tells her that he want's to, but that he want it to be special (well it would be, I can promise you that) and that he thinks they should wait to their wedding-night. And thus our comic ends, with the Warriors left with no other option but to watch, as their friend gets driven away to jail, wondering how they can go on. 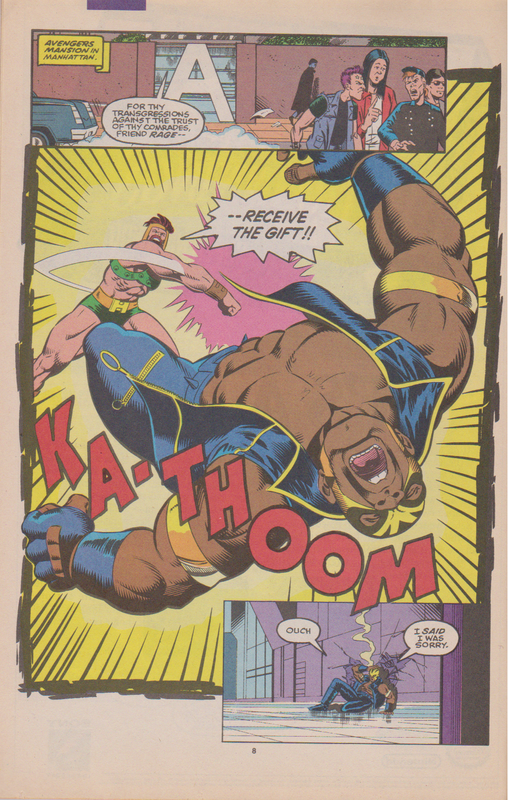 That was New Warriors issue 26. Next time, I shall give the first 26 issue of the series about my favorite Marvel team my final verdict.